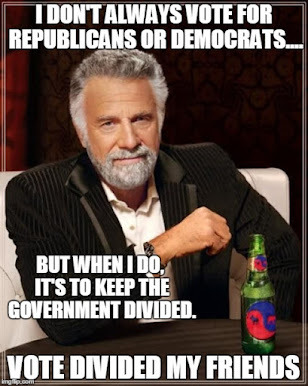 The Dividist Papers: Save the GOP! 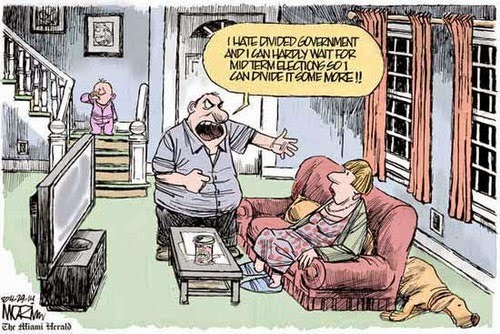 Vote for Divided Government! Save the GOP! 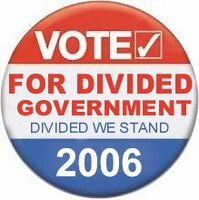 Vote for Divided Government! Save the Republican party from itself. "The combination of a long unnecessary war, the fiscal excesses disguised as compassionate conservatism, and an intolerant social agenda has almost destroyed the traditional Republican political coalition, leaving many of us without any enthusiasm for the candidates and policies of either party. The first step to restoring the Republican Party, ironically, may be a Democratic victory in the congressional election this fall. Several years in the political wilderness may do much to clear the mind." In other news, DWSUWF's YouTube video "Divided Government plays Hardball" has been selected by Ryan Sager (author of The Elephant in the Room) as the winner of the prestigious "Political Video of the Day" at Real Clear Politics. I am humbled by this selection, and would like to take this opportunity to thank all of the people that helped make this happen. The producer (me), the writers (me), the editors (me), Norman Ornstein, the star of the video who's stirring performance moved me to tears, Chris Matthews and MSNBC (for not yet suing me for ripping their material), and - of course my beautiful wife, who even as I write this is encouraging me with the words: "Get off that computer and get in here and help me with dinner!" It is actually: "Wes Tand Divi' Ded"
- which is a transliteration of a curse from an ancient Rumanian dialect, the full meaning of which has been lost to the ages. Coinicidently, it was also a sound used by the fremen as "power words" of the "weirding way" in a deleted scene from the 1984 version of David Lynch's Dune.